For many people, buying and decorating the Christmas tree is a favorite Yuletide tradition. Select a spot in the house that has easy access to an electrical outlet and is not in a major traffic area. MEASURE for height and width so that you can choose a tree that will comfortably fit the space you have. Nova Scotia Balsam Fir are available in a wide variety of heights, widths and densities to suit your specific needs. Find or buy your tree stand... make sure it can hold at least one gallon of water and is designed to support the size of tree you wish to buy. Take along a measuring tape, and some cord to secure the tree to your car. It you have a long distance to travel take along a cover for your tree to protect if from the sun and wind. If the tree has been previously cut... ask the salesperson to lift the tree a few inches off the ground and then drop it, stump end down. 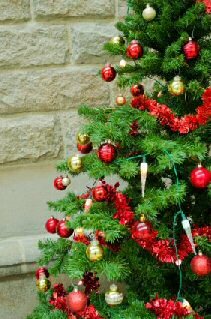 Don't be surprised to see older needles drop from the inside of the tree and a few fresh green needles from the outside. This is nature's way of recycling. Choose a tree that meets your needs and will support the type of decorations you have, but most important, choose a tree that makes you feel good. Buying the tree is a very special part of the wonderful experience of Christmas. As soon as you arrive home stand the tree in a bucket of water and store in a COOL, protected location out of direct sun and wind until you are ready to decorate. Before you put the tree in the stand make a STRAIGHT cut across the trunk, an inch or so above the original... this opens the tree stem so it can take up water. If possible, bring the tree inside the night before you want to decorate... this allows it to adjust to the warmer temperature gradually. To avoid dropping needles throughout the house you may wish to pull a tree bag over the tree. Tree bags can be purchased at most Department Stores or Christmas Tree Retail Lots. Lit candles and frayed cords are a NO-NO! Unplug lights before going to bed at night. Not only does this save electricity, it also helps the tree to cool down. Make sure there is water in the stand at ALL TIMES... trees can drink between 2 pints and a gallon per day! 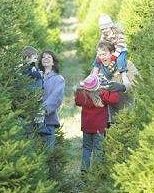 A little time spent caring for your tree will prolong the natural freshness and wonderful fragrance of your Nova Scotia Balsam Fir Christmas tree. After enjoying your natural Christmas tree, consider one of the many ways of RECYCLING it... better for you... better for EVERYONE!